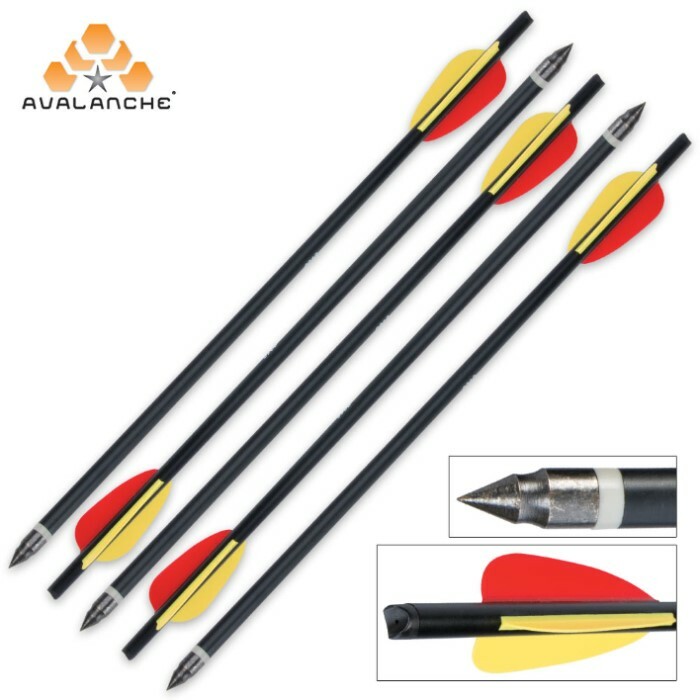 Crossbow Arrows 5-Pack | BUDK.com - Knives & Swords At The Lowest Prices! 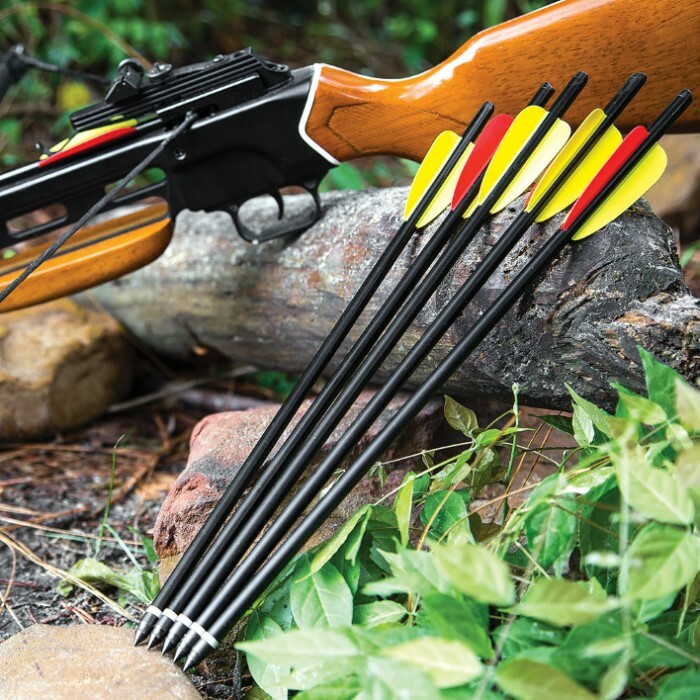 These crossbow arrows are the lowest-priced, quality crossbow arrows on the market. Don't pay up to $10 each for arrows to practice with in the backyard! Get five, 15" aluminum arrows with field tips pre-installed for this ridiculously low price! Don't wait because quantities are limited! Compatible with all full-sized crossbows. with all arrows you need to glue the tips or they will come off at some point, only a noob wouldn't know this already. These are good for getting started, but not strong enough for the 150lb crossbow, They were hitting my target and going all the way through it into the shed door. any slight bend and you lose all accuracy. You will need to upgrade to the carbon bad boys which dont bend at all. I missed low on my target and hit the cinder block it was resting on. The carbon arrow went through the front of the block and shattered the concrete. The arrow was fine, the block wasnt, true story. So for 18 bucks i feel just a little let down. And i did not expect much at all for 18 dollars. The tips on the Bolts came off after one use. They went through my target and into my backstop where they remain (dont really feel like digging out the tips). If you can get these on sale then go for it, but i see them as more of an option for emergency bug out use or testing targets out. You probably wont get more than one shot out of the bolt before it comes apart if you hit anything even remotely solid. They got here fast (~3 days) with a few other items. It's an exact replacement for arrows that come with the 150lb. draw crossbows in the catalog. Couldn't ask for more. It really helps to super glue the tips onto your bolts. It seems to work for me. I have not lost a tip in my target yet. It really helps with just targeting. Also dont glue all of your tips on. You might want to go hunting with other tips. It was a great buy for me so, have fun and shoot safe. Cheapest crossbow bolts I've found. Fly straight and if taken care of properly(don't leave outside) last a loooong time. I have had a problem with the heads coming off inside of one of my targets. Not sure if its the bolts or the target, but still great buy. These are the same arrows that come with the Trailblazer Tactical crossbow. They're pretty solid and sturdy, the field tips are sharp and removable. I shot these arrows through 1-inch thick plywood a half dozen times and they all held up perfectly - none of them broke or bent. You could definitely use these arrows for hunting if necessary, though I'd stick to smaller game with these. You could take a deer if necessary, I'd buy some metal arrows for that purpose (these are plastic). Still, very durable, good for the money. If you have one of the 150 lb crossbows from this site, these arrows are a good buy. They are far cheaper than buying crossbow arrows from a sports store in town. I don't think they would be best for hunting but for target practice, they do ok.